Editor’s Note – This is Part III of the five-part Real Estate Lead Generation Special Report a.k.a. the Local Zillow. You need to build a list of local residents, together with their physical address and contact details. It’s the single most important thing you can do this year to grow your real estate business! Don’t blog, shoot video, post on Facebook or start a Zillow ad campaign until you set up and start building your local resident database. We have homes (Inventory) and we have buyers, sellers and renters (Clients). Our business is really just about matching Clients with Inventory. Most of our clients are already local residents (sellers and renters) or will become local residents (buyers or renters). Most of our referrals come from local residents. That’s why you need a list of local residents. It’s basically a prospect list of qualified customers who are highly likely to buy, sell or recommend you to a buyer or seller in the next five years. If you break down why we do all the different types of marketing it all comes down to building a list of leads (lead generation) who most of the time turn out to be local residents. But building a list of residents is only the beginning as you also need to add their contact details and get permission to email, text or call them. The simplest way to build a list is to create an excel spreadsheet and start adding all your past clients, prospects and contacts. Note that I’ve combined my local residents list with their physical address to create a master Residents and Real Estate List (more about that later). That’s all you need for each home. You can add additional fields for additional features but the goal here is not to build a new MLS for you area. You just want the basic features for each home in your market. The smarter way to build your database is to go to your County Assessor office or local Title Company and download the local real estate database. Every County has an electronic version of the County real estate database. Usually all you need to do is go online and download it or contact the Assessor or Property Tax office and ask for it. Either way it is usually available and you can get it for free or a reasonable fee. If that doesn’t work go to a local Title Company and they usually have it or can get it for you. If that doesn’t work try a list broker or start building your own database from scratch (see above). The reason you want the County real estate database is because it gives you all your Clients (owners and renters) and Inventory (every real estate parcel) paired up in one electronic file. The list looks like this list that I downloaded from the Assessor’s website in my County, Boulder County. To find your County database online run a Google search using the keywords “town name plus real estate database” or “town name plus property database”. If that doesn’t work then run a Google search for your “town name plus assessor” or “town name plus property tax” or “town name plus treasurer”. If that doesn’t work then expand your search to the county level and replace the town name with the county name. In many areas of the Country the real estate database is managed on a County level. The worst-case scenarios are that your County or Town doesn’t have a digital database or doesn’t share the database with the public or doesn’t let you download the whole database or only allows you to search their database one home at a time or charges a huge fee to download the database. None of the above scenarios are good – until you remember that the opportunity lies in the obstacle. In any of the above scenarios it’s highly unlikely that you will have any competition after you build your own database from scratch. The easiest way to add their physical address is to get an electronic copy of the County real estate database as it comes with both the owner’s details and street address. This is an image from my County that I downloaded for free from the Boulder County Assessor website. 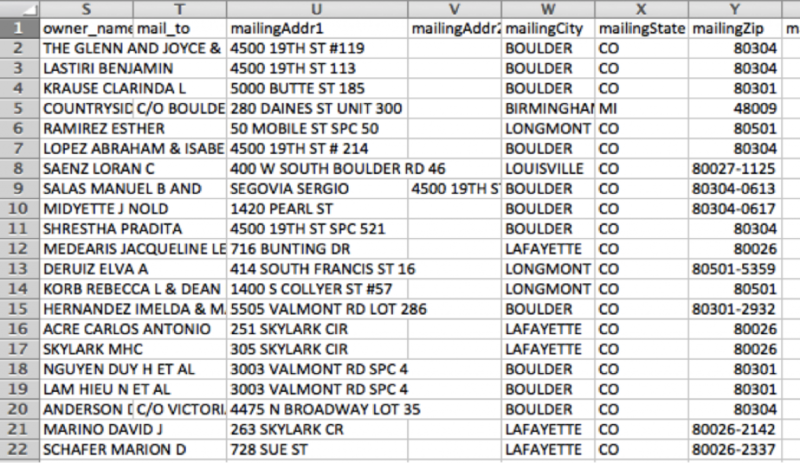 The file included every home in Boulder County and was downloaded in an editable excel spreadsheet. One more reason to love living in Boulder County, Colorado! The second option is to go to your Title Company. They will have a copy of the real estate database. It’s highly likely that your local real estate database will include the homeowner’s details. This kills two birds with one stone as you get a pre-packaged real estate and homeowner’s database. If you don’t get the homeowner’s details then you need to manually add the homeowner’s details or buy a list from a third party data vendor. Cell Phone – so you can call, send a text or phone message to the owner or tenant. The good news is that most property databases include a street address and also usually include a mailing address. If it doesn’t have the mailing address then you need to manually add the mailing address. In most towns your local post office will deliver mail to a physical address. This effectively means that you have a proven mechanism to deliver your marketing material to your target market (local homeowners). The problem is that it’s expensive to create and deliver direct mail at around $1 per item. If you have a local real estate database of 10,000 homes, that’s around $10,000 per mailing. You need to find a more affordable way to market to your target market. This is where things start to get a lot more creative and sophisticated. You goal should be to get an email address for every homeowner in your local market. If you get an email address for every homeowner you’ve basically accomplished the holy grail of marketing. That’s because you can send a message to everyone in your market area, any time you want, for next to nothing. When you think about it we spend all our marketing dollars trying to reach prospects. Our goal is generally to get a prospect’s contact details so that we can contact them and not wait for them to hopefully contact us. We advertise, hold open houses, write blog posts, give interviews, publish reports and shoot cool videos – all with the goal of getting contact details for prospective new clients. Our ultimate goal is to build a large contact list for every local resident. That’s why I love the Little Zillow project. It’s basically a project designed to build a local contact list of homeowners (our clients) matched to homes (our inventory). The problem with buying a list is that it’s almost impossible to adhere to opt-in and spam laws plus you have no relationship with the list. Buying a list is a short cut but ultimately you run into too many issues with marketing to the list. You can rent a list by getting the list owner to market your content to their list. The strategy here is to get the list owner to send traffic to one of your landing pages. When visitors go to your landing page they have the opportunity to opt in to your mailing list, usually in return for free information, like a real estate report, that you offer on the landing page. You won’t capture every visitor’s contact details but you will kick-start your list with highly targeted opt-in contacts. Don’t rent a list from a sketchy company that arbitrarily lets anyone with a checkbook buy access to their list. Their lists tend to be scraped, poorly vetted and rarely perform as promised by the vendor. Instead focus on a list where the list owner has a great relationship with their list so you can piggyback off their credibility and reputation. A good example is to do a deal with a local business that has a large client base or customer list. Get the local business to email their list with an offer for free but valuable real estate information. It’s basically a media buy that I highly recommend as a starting point to kick off your own list building. The best part is that you don’t need to pay cold hard cash to the list owner for marketing to their list. Instead do a co-promotion whereby you reciprocate by promoting the list owner to your client list and on your website. In reality the most common way to get an email list to diligently build the list over time. And the best way to do this is to create quality local content about your real estate market that you give to local residents in return for their email address. This is ultimately why we blog, shoot video and offer IDX search on our website. The advantage of building an email list this way is it includes permission to contact the person as they opt in to your list. This is where all your marketing and hard work in your community comes to fruition. There really is no short cut to getting permission to contact your list than by getting express opt in and consent from your list. The best option is to simply be patient and build your list from scratch making sure that you get people to opt in and consent to join your list. This route takes more time but it has the benefit of developing a real relationship with your list and greatly reduces the opt-out rate after they join the list. 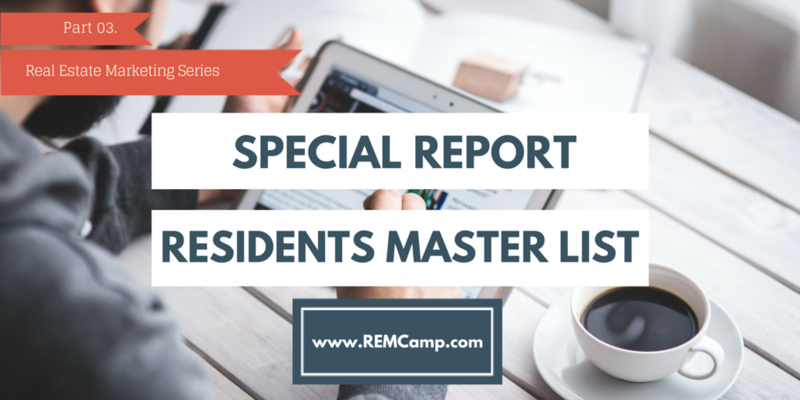 So how do you add email addresses to your master residents list? It’s a daily process that requires a disciplined and consistent approach and is applied across all your marketing channels. You need to add new contacts to your list every single day. Incorporate direct mail shots that promote your website and ask for an email address. The huge attraction of building a Local Zillow and Homeowners Portal is that you get local residents to register to enter the portal. We can “hide” quality content behind a membership wall and require registration to access the content. All our marketing efforts are focused on driving traffic to the portal and getting contact details (and opt-in permission) when a new member registers on the portal. The final element is that you need to manage your contact list and relentlessly maintain it and segment contacts into the right sub-lists. You can build your list in an excel spreadsheet but you also need an email manager. The email manager I recommend is Mail Chimp. It’s not the best email manager but it works perfectly well and there is a free entry level where you can add up to 2,000 contacts and send up to 12,000 free emails per month. You can also integrate Mail Chimp with your other marketing tools like Reesio or our Follow Up Boss (our recommended CRMs) and Lead Pages (our recommended landing page tool. Whatever you decide to do with your real estate business this year, don’t delay, start your local residents list today. In the next part of the Special Report on Real Estate Lead Generation we’ll cover how you build a Homeowners Portal and get every resident to join the portal.